1. To a food processor, while running, add garlic. Process until minced. Scrape down sides of bowl with a spatula. Add green onion and ½ cup parsley. Pulse just until minced. 2. Add beans, salt, lemon juice, tahini, oil, cumin and cayenne. Process on high until smooth, about 2 minutes. 3. Check consistency of hummus. If not smooth, process longer. 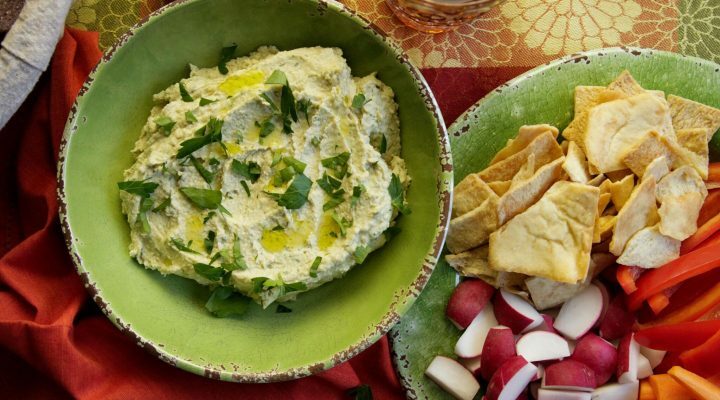 If hummus is too thick, add water, a tablespoon at a time, pulsing after each, to reach the desired consistency. 4. Taste and adjust seasoning. Serve drizzled with olive oil and a scattering of parsley on top.